The following is a toe punch numbering system that may be used. Good records are critical to maintain a properly rotating spiral system. The type of labeling isn't as important as the accuracy and record keeping of knowing what line each bird came from. 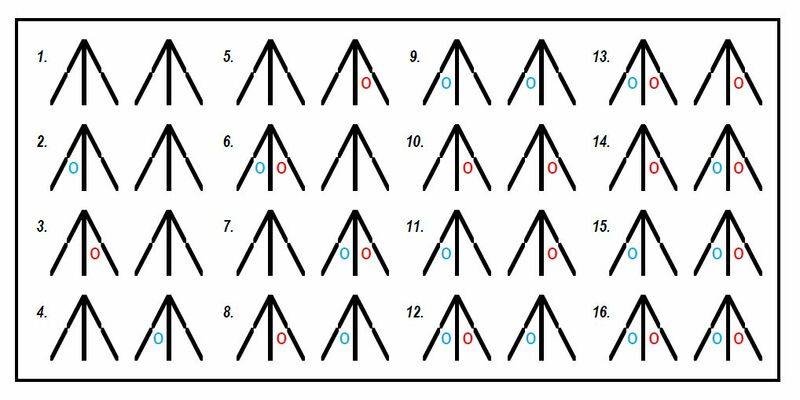 Standard Toe Punch Diagram, allowing for marking of up to 15 crosses, #1 being reserved for birds of unknown parentage. Form 3 breeding trios. These will form your 3 lines. Label one pen Line A, the second pen Line B, and the third pen Line C.
This is the line breeding year, breeding males and females from the same pen. A' daughters remain in the A line pen with their mothers, always adding daughters to their mother's pen. A' sons are compared to their sire and the best A line male is selected for year 2, as are the B' and C' sons. Sons should be compared to their father and the best male selected for the next year's pairings. Keep the males in a bachelor pen, but tagged / marked with the line that produced them so that you can determine which males you are choosing from for each year's pairings. This is the outcrossing year, breeding males cross over to the next pen's females. The year 2 A line daughters are again identified and placed back into the A pen with their mothers. The year 2 A line sons are identified and compared with their sire to determine the best male(s) for the next generation. At the end of year 2, all 2 year old birds are retired (the grandparents). Year 3, the cycle is repeated. Choose the best A line male (from year 1 or 2) and breed to the A best A line females, line breeding for the year. Year 4, cross over again as in year 2. Carry on, line breeding for a year, then out crossing for a year. In this manner, the males move over a line every other year. This is a very old system which has been used to keep enough genetic diversity in a closed line to prevent inbreeding depression. One family reportedly maintained a line of Rhode Island Reds for 90 years using this system with 5 matings each year.